Safe to copyright your works with PMW, I design, write & crochet my own patterns.Excellent service, keep up the good work PMW!! Protect My Work is a UK based user-friendly and affordable solution to protect against copyright theft of anything creative, whether you want copyright protection for songs, artwork, designs, photos, logos, books, training course material or even a whole website. Creatives can register their work at any development stage e.g. before pitching the idea, emailing the demo/prototype to a client or publishing to the public domain on popular websites & social media like Facebook, Youtube, Spotify, iTunes, Instagram, Amazon, eBay & Pinterest. All work registered with us receives a unique reference number and a fixed date stamped digital certificate to help prove your copyright. Set up originally by a group of creatives to help protect their own copyright, we are proud to say we have been providing an effective copyright deterrent for our customers since 2004 and are recommended by solicitors across the country. LOGOS & MARKETING MATERIAL Logos, Website Design and Content, Manuals , Course Material. MUSIC Music , Songs, Sound & Lyrics. ART WORK Designs, Drawings , Illustrations, Photos, Paintings, Sculptures. LITERATURE Books, Blogs, Poems, Articles, Plays, Screenplays , Scripts. As a professional musician and artist manager with a background in contracts, agreements, and copyright law, I was always looking for fast and trustworthy ways to register my work before share it with external partners. 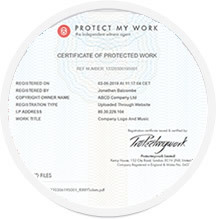 The reputation and customer service of ProtectMyWork, gave me the confidence to make them the first stop after each of my musical or screenwriting creations. This Site is Amazing! 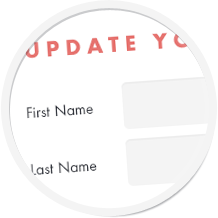 User friendly, well laid out design and appeal, easy steps to follow, done in less than 5 minutes. I have been with Protect My Work for nearly three years. It couldn't be simpler to create and add to your own work and ideas knowing they are safe with a simple link or email copy add when sending details. I thought it would be complicated, but I couldn''t have been more wrong. As a start up business, you don't always know if you're making the right decisions, but this is definitely one of them. You can check your work at any time knowing that its safely stored in certificates for you. I have only started using Protect My Work, but already I'm very impressed about how fast and effective they are at copyrighting my work. It is a simple process, too. It's also good to know that I can process future work in the same way at no extra cost! I am a absolutely happy with the service provided. Having experienced this copyright facility for the first time, I am very happy to have made my decision in using Protect My Work - the function to upload documents is seamless, the content of the site to assist users is clear and concise and the price to ensure governance over your cherished and protected ideas is very good for what your organisation offers. Keep up the good work as I will be using you now and the near future. Great positive fast service. Easy to navigate and fast response. Happy to protect our work with you! I just want to say thank you to Jonathan and the team, I had some issues at the beginning (all of my own fault) and even though he didn't have to, Jonathan worked very hard to help me put it all right. People who go above and beyond for others are what make this world a little better and I just wanted to say thank you publicly and give protectmywork.com 10 stars!! I am so grateful I found Protect my work,I had been doing the poor man's Copyright for many years and was beyond worried. Now that I am a member of Protect my work,I can sleep at night. Thank you for your amazing work!! This service is so easy to use!! Very pleased with the service, easy to use and efficient.Fantastic and competent service, very happy. I found ProtectMyWork to be the best thing that's happened to me. The process is so smooth, all done online and via email, so no phone calls and being put on hold. It's so easy to protect work via email, just send what you need in the message, all protected within minutes. The other benefits would be the price and the fact you're protected in over 172 countries in the world and the fact you can protect anything from images to sites. I would highly recommend ProtectMyWork to all my professional friends. Protect My Work has given me piece of mind as I make my way into the professional world and do not want any doubt that my work is my own. I'm A Upcoming Solo DJ & Music Producer And This Helps Alot And You May Aswell Take Advantage Of The Service By Mounting Your Own Song Artwork To Your Own Music Track & That's It, I Recommend To Any Upcomming Artists Who Don't Want To Take A Contract From A Record Label. Easy to use & great reassurance knowing my work & brand is safely protected. It's fast, easy and safe to copyright your work with PMW especially when I'm promoting my work on the internet. I write complete original musicals, the storyline, lyrics, libretto and music and I have used Protect My Work to look after my copyright for a number of years. I find the service quick and easy to use and when I need any help the Protect My Work people are efficient and friendly. a very professional service at a budget price where everybody can access their rights to copyright their work. Easy to use website features and downloadable logo and company website for protection and a professional look on my writing pieces. Fast and friendly service if have any questions need answered from the support team. They are cheap for £1 a token which I can upload multiple works. My work being registered on here has even made me be noticed from a publishing house and asked to use one of my poems in a poetry book with other creative writers from the UK. Just to say a big thank you. I joined Protect My Work today, to protect my company's artwork,logo, pictures, and Design ideas. The process was quick & easy. There was a glitch with the change of password, but a member of the team responded very quickly & helpfully to address this matter. It was sorted out quicker than I imagined it would be, to their credit. I look forward to a long and fruitful business relationship with Protect My Work, & the staff. I would be more than happy to recommend them to possible future clients. Such a great site - easy to use and explains all the legal information simply and to the point. Very quick to use, once I have a design ready it takes a couple of minutes for me to get it protected! Definitely recommend for the peace of mind it gives. Easy process to follow; quick and simple. Provides peace of mind for a very good price. Would highly recommend. I have 100% confidence that if I need to prove any of musical works being created by me that Protect my Work will be able to help with this in Court. I just wanted to say the service I received from you was excellent. Immediately we opened an account and we never looked back. A great company with top customer support. We highly recommend PROTECT MY WORK for peace of mind and security of your venerable designs and data. Having spent many hours writing down my years experience in Crime Prevention and then three months correlating it all into a readable format for publication I was concerned about my work being copied & reproduced by all and sundry. Then I came across Protect my Work website & it all became clear and simple. My work was uploaded and protected in less than ten minutes. I have more than enough to do without worrying about my work being copied without my permission. My thanks to Protect my Work, Peace of mind in less than 10 minutes & very reasonable fees. I highly recommend Protect my Work, after searching for who to depend on to protect my pics and poetry, I now have peace of mind. Staff are very friendly and extremely helpful. Great value for money. Quick and easy steps, help at hand. Fantastic site. Freddy James, The Freddy James Band. I found the whole team involved very professional and gave excellent rates. This is a real piece of mind knowing that all back catalogues of my work and current are protected from copying and unauthorised use. Highly recommend them to anyone who writes and records their own material. Fantastic, simply & cost effective way of protecting your work. An absolute must for ALL who create. Highly recommended! Most excellent copyright service, very important that copyrights are handled efficiently and without fuss, a first class service, and pleasant, professional to deal with. very good service, peace of mind for any artist or the like and a very easy to use website.. have used the site for many years now with no problems at all.. Excellent facility for protecting my music. Fast, economic and easy. Straightforward, consistent service. I've been using it for a number of years now, very satisfied with what they provide. Excellent service. So easy to use. Very pleased! Such a fast and easy way to protect the copyright of my photos! Very good site, reasonable price and very reliable! Great product would highly recommend to all. Excellent service. Very good customer service. Thank you guys!!! a £1 excl. VAT token is required for each piece of work you register with us (max 5 files per 1 token). Register today & receive 5 free tokens, that's up to 25 files protected for just £33.00 excl. VAT pa , with a 14 day money back guarantee! Using our simple email system, we record details such as the sender, receiver, the time and date the work was submitted ensuring that all work is logged and credited to its rightful owner while backing up and securing all data. After subscribing , all you have to do is attach the work to an email and email it to us. It couldn't be quicker or simpler. Once you have submitted your work, the date of submission cannot be altered and is therefore an extremely reliable source to prove the originality of the original work. Work submitted to Protect My Work is NEVER opened or looked at by our staff. Our automated system receives the work and stores it on our secure servers. By subscribing to our site, you will be entitled to use our logo on your work. This is designed to warn off potential copyright thieves and is a very effective deterrent from copyright infringement . Your work has been witnessed by us and you are sending a clear message that you are serious about pro-actively protecting your legal rights. We are proud to say we have been providing an effective copyright deterrent for our customers since 2004. Your satisfaction is very important to us, so we offer a 14 day money back guarantee. & £1 excl. VAT Per Submission Thereafter. Simply register as an author with us first. It only takes 2 minutes and all data is encrypted for your security. You will receive a welcome email with your login and full instructions. Then login to our member area and click the UPLOAD NEW WORK button. 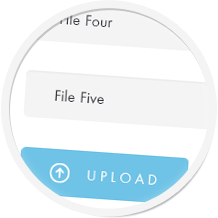 This allows you to securely upload your files to our secure vault. Alternatively, you can email the files to protect@protectmywork.com. Immediately after you have protected your work, you will receive an email confirmation from us. Each registered works has a unique reference number. Protect My Work was started by two web designers who found that when pitching graphic designs to potential clients, some would steal those designs and have them developed by others. As design creatives we understand the time, love and care you put into your work and how wrong it is for others to steal that work and use for their own gain. Protect My Work is a strong deterrent against the theft of your work. Once you can quickly prove ownership of your creative work, this usually stops continued use of your work without your permission. WHAT WILL PROTECT MY WORK DO FOR ME? If your work is being used without your permission, contact the other party and inform them your work is copyrighted and protected with Protect My Work and ask them to stop. In the vast majority of cases this will end the use of your work. Should the other party ignore your requests, you will have the right to sue for damages in court. In this case, Protect My Work with swear an affidavit stating we received your work on such date and time. This means the burden of proof then falls to the other party to prove they created the work before that point. © Copyright 2018 Protect My Work Limited. All Rights Reserved.